It takes a talented writer to get into the mind of the modern teenage girl, but Sarra Manning never seems to have a problem succeeding. 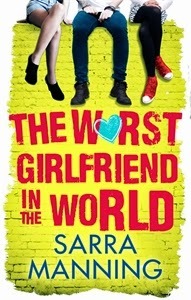 Her latest, The Worst Girlfriend in the World, is a tale of friendship, fighting and figuring out who you are. And boys. Franny Barker, known as Franny B, is off to college to pursue her dream of being a fashion designer. Yes, her mum is depressed, no one at college likes her, and she has to retake her maths and English GCSEs, but as long as she's got best friend Alice, she'll be okay. Only Alice, feeling like she's being left behind, sets her sight on Louis, the boy Franny B has had a crush on for two years. Manning knows the recipe for a good book, and taking the elements of growing up and putting them in a mixer, she's able to tell a readable, thoroughly enjoyable story. I loved both female protagonists, even though most of the time Alice was breaking friendship rules left, right and centre, and being a right cow. Still, she's a teenage girl and when you're in the midst of feeling insecure and hurt, you think anything goes. Franny B's home life was interesting as well, with Manning tackling depression in a forthright way. I thought Franny's mum was sensitively handled, while at the same time Franny B's interactions with her were realistic - it was great to see that Franny B was conflicted by her mum's illness, unsure of how to help her, unable to understand how her mum was feeling and why, as that added depth. The cast of supporting characters in Worst Girlfriend really made the book. I thought Franny B's fashion student peers and tutor were a varied bunch - Manning took the stereoptypes of goth girl, ornery old teacher and so on and gave them a fresh twist. And I loved Louis and his band Thee Desperadoes, they provided a lot of laughs. And of course, Francis, Louis' friend and feel Thee Deperado, was a sweetheart. It's easy to assume that Worst Girlfriend is going to be a story about boys, and while the central conflict between Franny B and Alice manifests itself in a fight over a boy and there is some romance, this is really a book about friendship and family - the kind you're born with and the kind you make. If you approach the book realising that, you won't be disappointed. I adore Manning's work anyway, and Worst Girlfriend made me laugh, and get annoyed at times, and all the angst made tears well up in my eyes (not good for a train journey), and overall made me wish I was still a teenager and simultaneously thankful that I'm not. How I got this book: From the room of spare books at work.